Get some professional help in the garden and let us do your winter pruning. Your evergreen shrubs and herbaceous perennials are ready for cutting back, so why not put your garden to bed, we can also clear up the leaves. Most of your evergreen shrubs will probably need pruning, there are some exceptions such as Viburnum tinus which will be flowering shortly (if not already) and these will need to done after flowering is complete. Herbaceous plants will now be looking very untidy and while we recommend grasses are left over winter, it is a good idea to clear off the dead stems of most perennials now so that any new growth in Spring is not damaged when cutting back at that time. It also removes any potential winter homes for slugs and snails. If you have shrubs that have grown completely out of hand, they can be cut back quite hard in many cases and our team will know if this is the case or recommend a staged approach to cutting back over two or three seasons. They can then grow back into a manageable sized plant. All the waste arising from the pruning is removed from your garden and taken to our shredding site, where the waste is composted and reused. Contact Pat on 0114 221 5066 for details on prices. Gardens this size are not common but it is nice when the chance to totally remodel the whole garden comes along. The clients wanted a simple layout, not too much fuss, but quality materials and lots of colourful planting. A large formal lawn is framed by a York stone slab path which leads to a sunken garden around an old Cherry tree. A circular Teak bench is installed around the trunk of the tree. Mixed borders line each side of the lawn and provide lots of colour from April through to October. The existing terrace was remodelled to allow a larger paved area which was centralised relative to the new patio doors on the house. This leads onto broad steps that pass through a rose garden edged with Lavender. A children’s garden was created in another area, with a climbing frame set among a series of mown paths flowing through a wildflower meadow. The front garden was changed to allow more parking with a large central border that wrapped around the boundary, resin bound gravel drive edged with Yorkstone kerb and Yorkstone tumbled setts forming focal panels of paving in front of the house and at the head of the drive. Subtle lighting spotlights feature planting at the front to make the house more welcoming. Our type 5 natural swimming pool installation in North Yorkshire completed its 6 weeks filter maturation cycle a short time ago.The pool is now ‘gin clear’ and ready for swimming, although I’m sure our client will wait until Summer now before he takes a dip. Natural filtration is achieved through the 25 square metre aggregate filter zone that is planted with Cyperus longus, a reed that captures the nutrients in the water. The 110 square metre swim zone has underwater steps that emerge onto the surrounding deck and a diving area that is 2 metres deep, a diving stone sits in the middle of the pool, perfect for bathing on a hot day. A bog garden wraps around the planting and filter zones, peppered with huge sandstone boulders, it makes a lovely transition between the formal garden and the wild flower meadow beyond. The deck surrounds the swim zone on three sides and features a 90cm water blade that emerges from a stone seat on the deck. The pool was designed with help of Alistair Baldwin of Alistair W Baldwin Associates, who had designed the whole garden and it sits beautifully within this space. Alistair’s arrangement of the bog plants (Lythrum salicaria, Polygonum bistorta and Iris sibirica) in bands across the garden will provide spectacular drifts of colour that frames the pool. Garden Style are a landscaping company that have a wealth of experience and offer a comprehensive range of landscape gardening throughout Yorkshire, Derbyshire, Nottinghamshire. They are based at Rhinegold Garden Centre in Loxley just outside Sheffield, where you will also find a huge stock of plants and garden accessories. If you are interested in a full on landscaping project or just a modest garden makeover we’d be happy to talk about your ideas. Tell us how much you want to spend and we will provide you with the best possible solution. A retired couple were downsizing and asked us to redesign their rear garden, which was very overgrown and totally unsuitable. They wanted to retain the mature planting on the boundary to maintain privacy and required comfortable paved areas that could be used to make the most of the sun at different times of day and for entertaining family and friends. A raised paved area had already been installed with the conservatory. Here are a few photos taken before we started work. We created a series of overlapping circles that linked the different areas of the awkwardly shaped garden and used tumbled Indian sandstone slabs and setts for the paths and the two patios. The setts were also used to edge the gravel areas. A small, curving lawn helped to lead the eye down the garden with narrow, but lush planting areas around the garden allowing the clients to enjoy some of their favourite plants. Oak pillars edge one patio and lead to the arch in front of the shed. An Oak and stone bench curves around part of the main patio which in turn is framed by a Hornbeam hedge that helps screen the garage. The oak pillars have prompted the clients to call their garden ‘Woodhenge’. 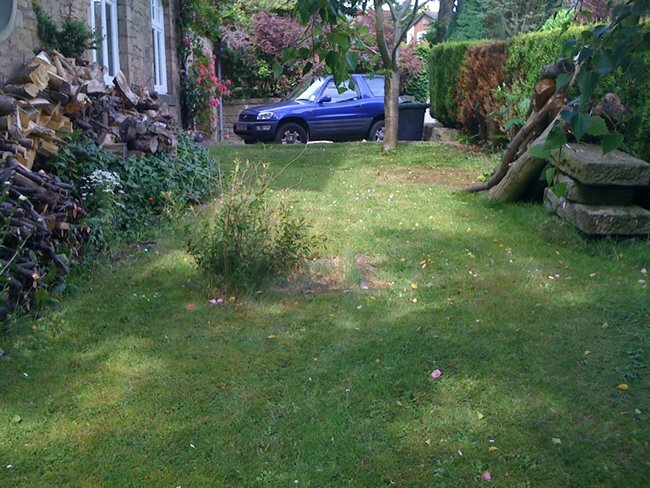 We were asked to transform this front garden in Hathersage. The starting point was a fairly basic lawned garden with a hedge along the outside edge. We started by clearing the space, removing the lawn and taking down the hedge. We then laid the patio which was to be the central theme of the new garden. A close up of the patio before planting. We completely transformed the space by adding in a shaped patio with ornamental grasses set into the pebbles and a variety of plants and shrubs planted in curved edge borders. The finished front garden is now a lovely light area with plenty of interesting detail. To find out how we can transform your garden call us on 0114 221 5066 and speak to one of our expert garden designers today. When you want a garden for entertaining, the starting point is to look at how the garden will be used. Our clients wanted to revamp their garden so that they could make better use of it. The whole garden was fragmented, uninviting and not a pleasant place to entertain friends, the existing patio was in the wrong place as it only got sun late in the afternoon and this left nowhere to sit during the day. Garden Style’s solution was to turn the garden around and have the main entertaining area at the end of the garden, with built in benching using brick and oak and a pergola with brick pillars and oak beams. The brick was chosen to reflect the brick detail on the house, Indian sandstone slabs were used on the main paved areas and the path links were paved in block paved setts reclaimed from the front garden. The morning sun strikes a small sitting area that will house a bench or swing seat where the clients can enjoy an early coffee. Oak sleeper raised beds create immediate volume and define the edge of the planting areas. The planting is mixed, low maintenance, lots of foliage but with plenty of seasonal interest from flowering plants such as Catmint, Verbena bonarensis, Sedum, Lavender and shrub roses. The pergola has Wisteria that will be trained over the top beams and will look fantastic each May. Changes were also made to the front garden with steps and raised beds up to the front door constructed in stone with brick detail to reflect the detail on the house. The main use for the front garden is now a play area for the children, the lawn is larger and has artificial turf for a clean surface all year round and the deck was revamped with a new balustrade and the surface jetwashed. Space at the side of the house is now used to store tools and children’s toys.